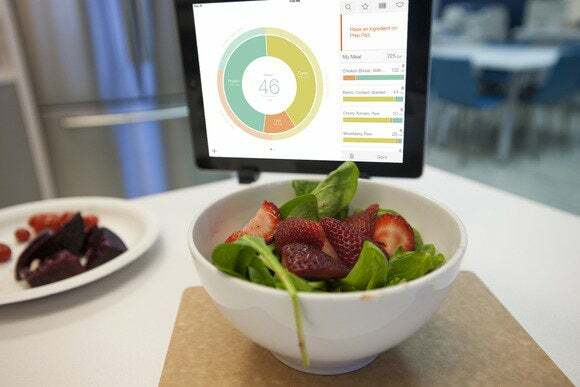 We’ve yet to see a wearable device that can automatically track what you eat—and it looks like we won’t for some time—so what’s a quantified nerd to do? Orange Chef’s Prep Pad scale and companion Countertop app make tracking your food intake easier, including not only calories but also the nutritional breakdown, so you can aim for balanced meals while keeping an eye on portion size. Since we’re stuck logging our meals manually for now, you might think spending $150 on a smart food scale is overkill. After all, manual calorie traking is built into comprehensive health-tracking apps like Fitbit and Jawbone, as well as tons of dedicated food-tracking apps like Tap & Track. Go ahead, slop beet juice on your Prep Pad. You can sponge it right off. Those all require you to look up foods in a database, which has some big drawbacks: You can confirm that the calorie counts are accurate if you’re eating a lot of packaged foods that print nutrition information on the wrapper. But that’s a terrible way to eat. Cooking from scratch is far healthier, but harder to track. Your database might say an apple is 70 calories. How big an apple? What if I don’t eat the whole thing? What about this dish I’m making that has a dozen ingredients? Since Prep Pad weighs each ingredient, the calorie tracking will be more accurate. And if you build a multi-ingredient dish and then save it, you can weigh out a portion of leftovers later and know just how many calories you’re about to microwave up for lunch. But calories aren’t even the whole story. Prep Pad keeps an eye on your nutrition too by breaking down everything you eat into ratios of carbohydrates, protein, and fat. That way you can be sure each meal is balanced, and keep an eye on how balanced your diet is over the course of a day or a week. Let’s walk through how it works. When you first launch the Countertop app, available for iPad 3 and later, you’ll set up your profile. It asks for your height and weight and activity level, and you’ll be forgiven for thinking you might have launched Fitbit by mistake. Countertop needs those stats to determine how many calories you should eat each day, and it defaults to the USDA’s recommended nutritional ratios: 50 percent carbs, 20 percent protein, and 30 percent fat. But you can tweak those to your liking. Tell the Countertop app about yourself, then tweak the default calorie goals and carb/fat/protein ratios to your exact needs. Once you’re ready to get cooking, you just have to press the Prep Pad’s single button to connect it to your iPad through Bluetooth. Thanks to Bluetooth Smart, this happens right inside the Countertop app—you don’t have to back out to the iPad’s Settings app to pair. Then you just place something on the Prep Pad. It’ll notice, and ask “What’s on Prep Pad?” You tell it your ingredient by tapping one of the icons above that prompt. You can search Prep Pad’s extensive database, tap the star to find an ingredient in your own favorites list, tap the barcode to scan a packaged food’s barcode with the iPad’s camera, or tap the icon that looks like a bowl to tell Prep Pad that the object on it is actually a container rather than food. Doing that will “zero” the scale, so when you start adding ingredients to the container, only the ingredients themselves are weighed—it’s a crucial feature you’ll use all the time. Since you weigh each ingredient one at a time, the Countertop app knows how much weight is chicken, how much is beets, and how much is bowl. Once you tell Countertop what your ingredient is, the graph springs to life, showing you that ingredient’s calorie count, and protein/fat/carb breakdown. You can add or subtract the same ingredient until you’re satisfied, and then tap it in the ingredients list to lock it in. A little lock icon shows up, and then you can add another ingredient alongside it, or even remove the first ingredient from the scale—don’t worry, it stays in your meal. It’s really fun to see how adding more ingredients makes the graph update. The graph always shows your entire meal at once, so it’s neat to be reminded how, say, your all-veggie salads are pretty much all carbs until you add some beans or tofu for protein, and some dressing for fat. As you build your meal, Countertop displays a "balance score" out of a possible 100, which is perfectly balanced to your goal ratio of carbs, fat, and protein. Not every meal will hit that magic benchmark, but it can be illuminating to quantify how close you came each time. It turns out my gut-bomb of a Crock-Pot ham-and-cheese-and-potato casserole (6 servings!) is still 66 percent balanced—and shockingly low in fat. Once you’re happy with the meal you’ve built, tap the Save button. Then you can name your meal; log it as breakfast, lunch, dinner, or a snack; and even snap a picture. That might seem silly, but I recommend taking the time: Countertop has a screen that displays all your meals in a grid, and it just looks nicer with real pictures rather than the generic empty-plate placeholder. It’s a nice-looking app—you want your lunch to fit in, don’t you? Another reason for taking a pic is to share your meal. Countertop can post each meal to social networks (Facebook, Twitter, Instagram, Pinterest) to get your friends salivating, but it can also log your meals in Evernote or send them by email. Those last two options are helpful if, say, you’re using Evernote Food as a culinary diary, or you want to email updates to your nutritionist, doctor, or trainer. Prep Pad and Countertop are at their best when they make you more mindful of what you’re eating. Just how eating more slowly can help your brain realize you’re getting full and keep you from overeating, carefully adding each ingredient to Prep Pad before throwing it on your plate gives you a chance to really consider its impact on the balance of your overall diet. Breakdowns for each meal provide more granular detail. Prep Pad can even help you “hack” your recipes and make them healthier. If you typically use white rice, you can see how switching to brown rice—or a protein-rich grain like quinoa or farro—affects the nurtitional makeup of your final dish. The main graph in Countertop always shows your entire meal’s balance, but if it’s showing too much fat or too little protein, you can consult the smaller graphs for each ingredient in the list to see what you might want to swap out for a healthier choice. I did have a few quibbles, but they’re pretty minor. The barcode scanner is finicky. I had trouble getting bar codes to scan with the iPad’s front-facing camera, and even when using the more powerful back camera, it was still hit or miss. Barcodes on flexible packages like chip bags or granola bar wrappers almost never scanned, and barcodes on boxes were 50/50 at best. It was almost always quicker to just search for the ingredient in the database. The Countertop app's lovely meal log will make you want to photograph every plate. Prep Pad is meant for cooking, obviously, but once I got addicted to the meal-tracking feature, I wished it was just a little easier to log meals I didn’t make myself. Since the Countertop app can give you a composite balance score for a day or even an entire week, I wanted that score to factor in the Five Guys cheeseburger I had for lunch without me having to break down that burger and weigh each ingredient. Still, that’s not what it was designed for, and if my geeky obsession with total quantification leads me to make more meals at home, that’s ultimately a good thing. And Prep Pad excels at leftovers—you just find the meal in your log, tap it, and choose “Add to My Meal” to let Countertop know you’re having seconds. I’ll just have to pack leftovers for lunch more often. Countertop’s iPad-only status is a bummer too, but only a temporary one. The Orange Chef Co., which makes Prep Pad, plans to roll out an iPhone app later this summer. And the company is also working on a “just weigh this for me” basic-scale mode, since as it is, Prep Pad is less useful than a plain-jane digital scale if you’re just trying to weigh out 17 grams of coffee beans to grind up for your Aeropress. Prep Pad is one of the most useful pieces of technology to grace my kitchen since the dishwasher. While its $150 price tag seems steep, if you need help with portion control or encouragement to cook more, Prep Pad can really pay off. Even after you train yourself in the basics, the recipe-hacking and leftover-tracking will keep you coming back for more. What you put in your body is incredibly important, and Prep Pad keeps you accountable while making balanced eating fun.